HMD Global, the home of Nokia phones, today announced the Nokia 8, a high performance, beautifully crafted smartphone, designed with content creators in mind. The Nokia 8 brings three world-firsts to Android smartphones, including a debut collaboration with ZEISS optics. With performance and pure Android at its heart, as well as the most advanced aluminium unibody design to date, the Nokia 8 represents all the hallmarks of a true flagship Nokia smartphone. 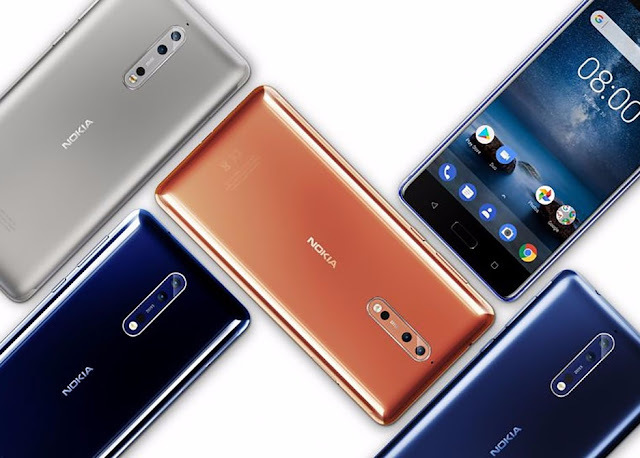 Be less Selfie, be more Bothie: The Nokia 8 introduces a world-first in enabling Dual-Sight video to be livestreamed natively and in real-time to social feeds such as Facebook and YouTube. Dual-Sight simultaneously harnesses both the front and rear cameras in a split screen visual for both photos and videos. With just one touch, this world-first livestream capability gives more immersive experiences for those who love to create and share special memories. Nokia 8 is also the first smartphone to feature Nokia OZO Audio, placing exclusive Hollywood technology in the palm of your hand. OZO spatial 360° audio brings a fully immersive audio experience to your 4K video. Leading-edge 360° audio capture ensures the playback lets you truly relive the moment so your memories never fade. 4.6mm thin at the edge and just 7.3mm slim on average, Nokia 8’s seamless unibody is precision milled from a single block of 6000 series aluminium and its pure design has been refined through a 40-stage process of machining, anodizing and polishing. Select models feature a high-gloss mirror finish that has taken over 20 hours to complete to achieve a flawless look. The phone features Qualcomm’s powerful SnapdragonTM 835 Mobile Platform and paired with the pure, secure and up to date Android experience ensures outstanding performance.